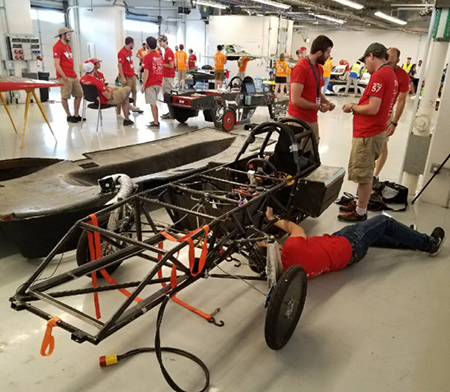 The Southern Illinois University Edwardsville School of Engineering’s (SOE) Solar Car Team is celebrating its first top 10 finish in the Formula Sun Grand Prix (FSGP) held July 2-8 in Austin, Texas. After passing grueling “scrutineering,” or inspections, and completing racing on a 3.426 track, the team achieved its best placement yet at 10th among 18 teams from such institutions as University of California, Berkeley, Georgia Tech and Northwestern. The team comprised 11 current students with majors spanning engineering, business and nursing, five SOE alumni and two faculty advisors. NOVA, the solar car, is built to operate only on energy stored in batteries that are charged by the attached solar array. “On the first day of the race, following scrutineering, the team was faced with a solar array that was not outputting the amount of power expected,” Endsley explained. “By day three, we had completely rewired the array. We were outputting nearly four times the amount of power seen on the first day of the event. Team members included Endsley, Cooper, Edwardsville natives Michael Schalk, James Bannon, Chris Oliva and Jessica Garbe, Syd Stogner, of O’Fallon, Gabriel Calixto, of Bethalto, Jared Bargetzi, of Highland, Emmery Mammen, of Lincoln, and Rachel Roady, of Chicago. Alumni participants were Blake Fry, Brittany Riddle, Matt McQueen, Zach Crawford and Preston Steffey. Photos: The SIUE Solar Car team finished in the top 10 at the Formula Sun Grand Prix (FSGP) held July 2-8 in Austin, Texas. SIUE Solar Car team members employed quick and critical thinking to make necessary modifications during the competition that enhanced their success. 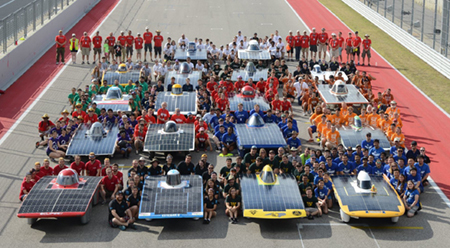 Eighteen teams competed in the 2017 Formula Sun Grand Prix.